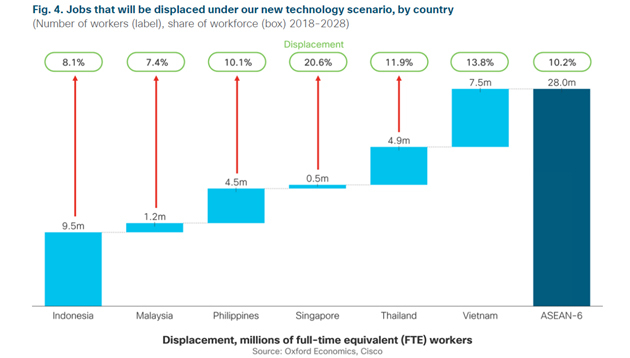 A new report by Oxford Economics and Cisco explores what the next decade of technological change will mean for ASEAN workers. By leveraging data on 433 occupations across 21 industries, it modeled the the impact of technology adoption patterns on the 275 million FTE workers in the six largest ASEAN economies – namely, Indonesia, Malaysia, the Philippines, Singapore, Thailand, and Vietnam. Singapore’s labour market faces the largest degree of job displacement over the next decade, while Malaysia expects the least job displacement in ASEAN. Analysis shared below on the basis of jobs created versus displaced in each country. 2 million existing roles will disappear from the labour market, pushing workers into other industries and occupations. 250,000 existing roles will disappear from the labour market, pushing workers into other industries and occupations. 1.1 million existing roles will disappear from the labour market, pushing workers into other industries and occupations. 85,000 existing roles will disappear from the labour market, pushing workers into other industries and occupations. 1.3 million existing roles will disappear from the labour market, pushing workers into other industries and occupations. 1.8 million existing roles will disappear from the labour market, pushing workers into other industries and occupations.